I am always amazed to find something original in better condition than the copy. I thought they made copiesbecause the originals were in such terrible danger of deteriorating. 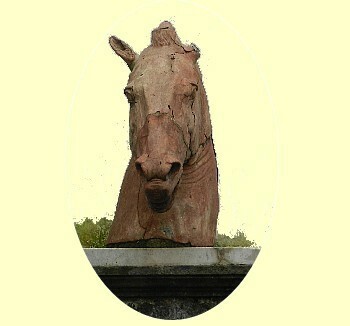 That is why I set out to find the building in Naples called, popularly, ‘the house of the horse’s head’. I had heard that there was a copy in the courtyard of a bronze horse-head, a gift to Carafa from Lorenzo the Magnificent. Much popular superstition has formed around the statue over the years: for example, merely bringing sick animals into the presence of the statue was said to work miraculous cures! Naturally, the original statue would be lost, destroyed, ravaged by time or otherwise not at my disposal, so I had to find the copy. In my heart of hearts, I was hoping to find peasants bringing their sick goats and sheep to be healed. Alas, the building was an absolute mess. It was in the agonizing process of being restored. There was scaffolding on every wall in the courtyard; bricks were strewn about; and everything was covered with fine powder blown off the piles of plaster and cement. General construction debris was everywhere. But the horse was there. The head was mounted on the back wall of the courtyard at about eye-level, but it was barely visible beneath a rickety framework of pipe-and-wood scaffolding; there was an overturned wheelbarrow in a pile of stucco nearby. The statue was covered in grime and had become totally non-descript. Indeed. I found the real horse's head, but not exactly where the gentleman said it would be. The city —ever onward in its campaign to bring art to the people— has moved this original gift from Lorenzo the Magnificent next door to the new Museum stop of the Metro line. A train station. Thus, as you trot down the stairs to get your train, you look up over the entrance and there it is, encased behind protective plastic. It is truly splendid and I shall return. I have a goat that is not feeling too well. update, Jan 2012: Well, the courtyard where I first looked for the copy of the head some years ago finally got cleaned up. Unfortunately, the horse is not feeling too well at the moment, either. One ear is missing (photo).